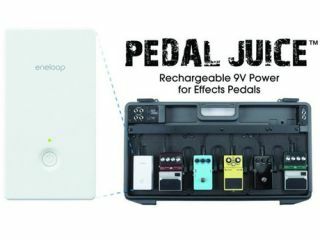 Sanyo has announced Pedal Juice: a rechargeable battery built specifically for powering musical instruments on the go. For guitarists, the 9V lithium-Ion unit promises to provide 50 hours of playing time if you're only using one standard pedal. It even claims nine hours when you're hooked-up to a daisy chain of six effects (including a wah-wah pedal) and a tuner. Other examples in the press release include a keyboard (two hours of playing time) and a percussion pad (90 mins). The big selling-point for audiophiles is that it "eliminates AC ground loops". However, it does cost an eye-watering $150, so you'll have to recharge it quite a lot and hope it cleans your tones to Hendrix levels of greatness to get your money's worth. It does sit nicely on a pedalboard, though.